Top Left Bar - see your page's details, perform basic page actions, use the Selection Tool, change your current Viewing Mode, or Undo & Redo recent changes. The Canvas - drop components here to add them to your page. Select components to edit, duplicate, and remove them. Top Right Bar - these three tabs dictate the content that populates the Right Pane. When you first open the page editor the first tab, Components, is selected. Click the second tab to access your Page's Theme or the third tab to access your Page's Meta Information. Right Pane - the active tab, in the Top Right Bar, dictates this region's content. This can be either a grid of all components, your page's theme or meta information. Basic Page Actions - see details of your page - such as its name - and perform basic actions accessible in the dropdown menu. Click the three dots to open the dropdown. Component Selection Tool - change the components that are available for selection. Viewing Mode - change your viewing mode to see how your page looks on different devices. Undo & Redo - undo & redo recent changes. Publish - publish your page online with the most recent changes. Publish - publishes the most up-to-date version of this page. Get Url - gets the url of this page. Preview - views this page in a new tab - as if it were published. Deactivate - removes this page from your domain - taking it offline. Duplicate - clones this page. Edit Details - accesses the name and description of this page. Save as Template - saves this page as a Page Template. Trash - deactivates then trashes this page. There are three tabs in the Top Right Bar: Components or Component Details, Page Theme, Page Meta Information. Only one of these three tabs can be active at a time. The active tab dictates the content of the Right Pane. Components or Component Details - access all addable components or view a selected component's details. Page Theme - set your page's theme to maintain a consistent style. 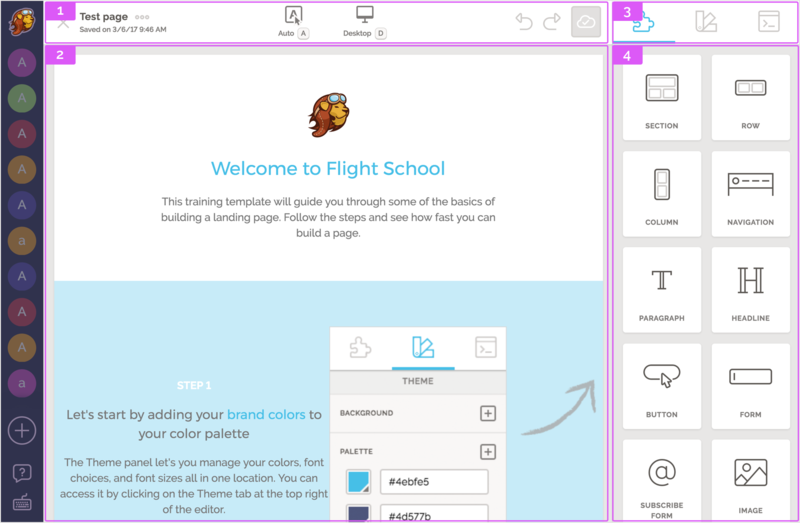 Add your color palette, select your font families, and scale your font sizes. Page Meta Information - set your page's meta information to improve SEO. Upload your favicon; type your title, description, and target keywords. If you are linking this page on social platforms upload a custom image and specify a title & description - for each platform.